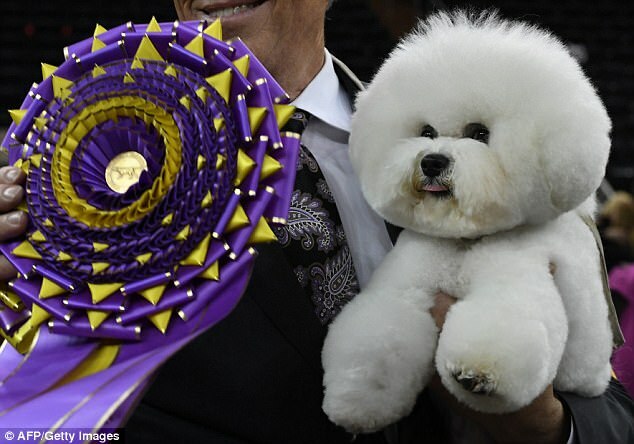 A Bichon Frise named Flynn has been awarded Best in Show at the 142nd Westminster Kennel Club show. GCHP CH Belle Creek’s All I Care About Is Love become the top dog on 13 February 2018. The five year old male beat 11 Bichons to become Best of Breed, and 20 Best of Breed winners to take the top spot in the Non-Sporting Group on Monday evening. He then returned to Maddison Square Garden to compete in the Best in Show final on Tuesday. Reserve Best in Show was Ty (GCH CH Ingebar’s Tynan Dances With Wildflowers), the Giant Schnauzer from the Working Group. Other finalists included Lucy, a Borzoi; a pug named Biggie; Slick the Border Collie; Winston, a Norfolk Terrier; and Bean the Sussex Spaniel. Bean is awarded our ‘Mr Congeniality’ prize for his special trick of sitting up like a person in the ring.